This isn’t the first pair of Volt gloves I’ve reviewed. 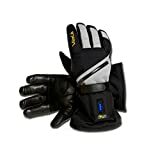 I’ve also tried out the Tatra and the heated Work Gloves and they were both great gloves so I have pretty high expectations for the Volt Resistance heated gloves. The Volt brand (also known as VoltHeat) is a niche company that specializes in heated clothing. They have a large lineup of different garments including heated pants, jackets, vests, scarves, footwear and hats. I’ve tried the heated slippers but I haven’t tried any of the other garments outside of the gloves. What I know about the Volt brand is that they make high quality products at a reasonable price. I’d say that Volt is right up there with the top heated glove brands like Gerbing, Outdoor Research, Venture and Hestra but out of these 5 brands I would rank Volt #5. That’s not to say that Volt isn’t great. They’re a high end brand and just to be in the same company as those other 4 brands is a huge compliment in my mind. One thing I would say is that out of those 5 brands Volt is one of the cheaper options which has helped them become more popular. The Resistance gloves are pretty much exactly what I expected out of Volt which is a good thing. These gloves are warm, reliable, waterproof and high quality so you can rest assured that your money would be well spent on a pair of these. The first thing I noticed when I put them on is that they have great dexterity, far better than I was expecting. Since they’re heated they can get away with using less insulation which helps improve dexterity and mobility which are two huge factors in comfort when it comes to gloves. I had no problems operating zippers, buttons or even small electronics. By looking at the picture you probably can’t tell that they’re low profile but in real life they look sleek which is nice. The interior is made of a soft tricot lining which pretty much just feels like fleece. It’s a really nice material and it’s very comfy. The exterior is made of nylon with a leather palm. The leather palm is really nice for comfort and helps a lot with grip too. As for warmth I’d say that these were better than average for heated gloves but not the best I’ve tried. The lowest setting isn’t too good to be honest. It’s not even very noticeable especially if it’s really cold outside. The middle setting is quite a bit better and that’s actually what I used the most because the high heat is quite warm and not really necessary in my opinion unless is sub zero. If the heat isn’t turned on the gloves are’t all that warm. They don’t have too much insulation so they lose heat quite quickly but that’s not a big deal since they are heated gloves after all. For comfort I’m giving these gloves a 19/20 and for warmth I’m giving them a 16/20. These gloves are definitely water resistant but they aren’t 100% waterproof. What I mean by that is they fair really well in wet snow conditions and they even do well in the rain but after longer periods of time in those conditions they leather palm will start to absorb water. This isn’t that big of a deal and it has to be very wet for this to happen but when it happens they start to feel heavy and soggy which can get slightly annoying. This is actually very common with ski/winter gloves. A lot of gloves use leather on the palm because it’s durable, comfortable and good for gripping things but there’s no way around this water issue. By no means is this a huge problem but if you plan on constantly being is wet conditions you’d probably be better off with a pair of gloves that is 100% nylon or gore text like the Venture Epic 2.0. Aside from that they did really well so I’m giving them a 19/20 in this category. I couldn’t find any reason to dock them points in the quality category. Much like any of the other Volt products I’ve tried these gloves are made with quality in mind. The stitching is tight and strong, the palms are double lined for durability, the zipper is tough and the cuff strap is strong. You won’t have any issues with these holding up to any recreational activities but if you plan on doing heavy duty work using power tools or equipment you might want to look into the Volt Work gloves instead because the Resistance gloves are only made for recreation. The battery is always a touchy subject because there are some people out there who thing these things should be able to run for 12 hours straight and that’s just not possible with the technology available to us right now unless they start using 5 pound batteries which nobody would be happy about. They have to try to find a balance between battery size/weight and life. I think they did an okay job with these gloves. They come with two 7V rechargeable lithium ion batteries and a charger that can charge them both at the same time. Volt claims that they will get between 2 – 8 hours of heating time. What this translates to is they’ll get 2 hours if you keep them on the high setting and they’ll get 8 hours if you keep them on the low setting. In reality I think most people would switch between the three settings and sometimes have them off completely as the temperature fluctuates. My personal results were a little different than theirs. I was able to get 2.5 hours on the highest setting which I was happy about but I didn’t fair so well on the lowest setting as they only lasted 6 hours rather than the advertised 8. On the day where I wore them skiing I was constantly changing between all three settings and periodically turning them off completely as I warmed up and that day they lasted 5 hours. This left me with a dead battery with about an hour left of skiing. Not ideal but not terrible either. I’m giving them a 16/20 in this category. These gloves definitely fit small. I usually wear a large but I had to get the XL in these. If you’re not sure what size you should order you can have a look at our sizing guide. In the end I was happy with these gloves. I’m glad that Volt is able to make a glove that can compete with the expensive, high end brands for a lower price. The Volt Resistance heated gloves would make a great intro glove for anyone who hasn’t tried heated gloves before. I don’t say that because they’re “Beginner” gloves but instead I say that because they’re cheaper than some of the really high end gloves like Hestra or Outdoor Research. The fact of the matter is that they are great for a lot of different activities which is great. Most people need a glove that is versatile because our activities are always different and the climate is always changing. Please let me know if you have any questions or comments about these gloves or any other gloves I’ve reviewed. You can use the field below to contact me and I’ll be sure to respond ASAP.